Walking with Jesus: Day 194: John 19:1-16 & Psalm 80 - Who Gave Pontius Pilate the Authority to Crucify Jesus? Day 194: John 19:1-16 & Psalm 80 - Who Gave Pontius Pilate the Authority to Crucify Jesus? Who Gave Pontius Pilate the Authority to Crucify Jesus? It is hard to submit to governing authorities, especially when we see then doing wrong. It is hard to see our taxes supporting wrong-headed ideas. It is hard to obey laws we believe to be mis-guided (not laws requiring us to sin, just foolish ones). When we feel the weight of flawed government hanging on us and when we are tempted to resent and rebel, we can look to Jesus. Yes, even in times of government discontent, we can look to Jesus. Today, we see Jesus standing before an unjust governor, ruling poorly and representing a repressive foreign empire. We see Jesus face-to-face with a man whose name has come to be synonymous with injustice. Yet we do not see Jesus lecturing Pontius Pilate on the principles of sound governing. We do not see Him complaining. Rather, we see a calm and confident Jesus telling the truth in loving humility. Jesus' calm confidence is so deeply disturbing to Pilate that he repeatedly gets exasperated. One time, as Jesus stood silently before him, Pilate said, “You will not speak to me? Do you not know that I have authority to release you and authority to crucify you?” In response, Jesus profoundly revealed the source of His great calm and confidence: "You would have no authority over me at all unless it had been given you from above." Jesus actually tells Pontius Pilate that the authority he has to crucify Jesus has been given to him by God Himself, Jesus' Heavenly Father. Are we really supposed to believe that the power of Pilate was entrusted to him by God? Yes! More than that, believing it should give us confidence and peace. Think about the alternative and this will make sense: Either Pilate's power was given to him by God or else some power in the world is being exercised outside of God's sovereign control. Which is scarier? We need to believe that everything in this world is under the control of our heavenly Father, just like Jesus did. Believing this gives us the assurance that any injustice which may happen to us comes through the hands of our loving Father and is intended by Him for His glory and for our greater good. That's what Jesus knew! He was facing the single greatest injustice in the history of the world: the shameful public execution of the single truly innocent man in the history of the world, a man whose whole life was love and service. If Jesus could face Pontius Pilate with confidence, we can face anything the world may have in store with the same peace. We can face our rulers and our enemies with equal calm confidence in our Father who ordains all power and all use of that power for His greater purposes. chosen in love and redeemed in Christ. the place where You dwell. the ones You have adopted and given Your own name. Yet, O Lord, look at Your household! we are lukewarm, compromised, cowardly, crooked and divided. we are violently persecuted, outlawed, harassed and suffering. Have mercy on us! Be gracious to us! 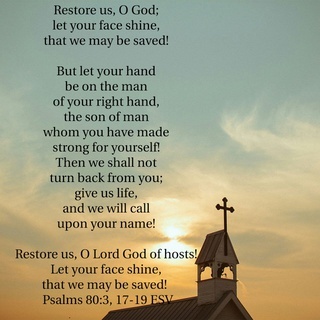 Restore us!